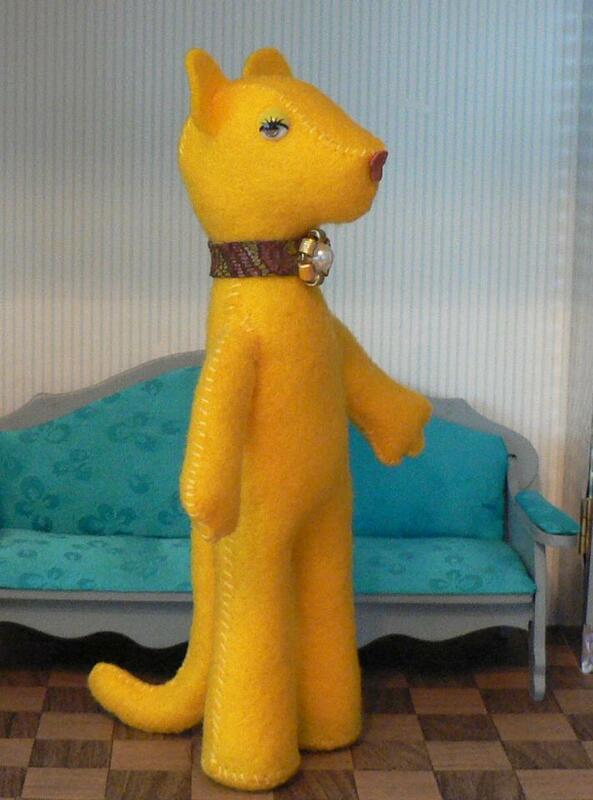 This doll is made of felt. I have no idea what species it is. 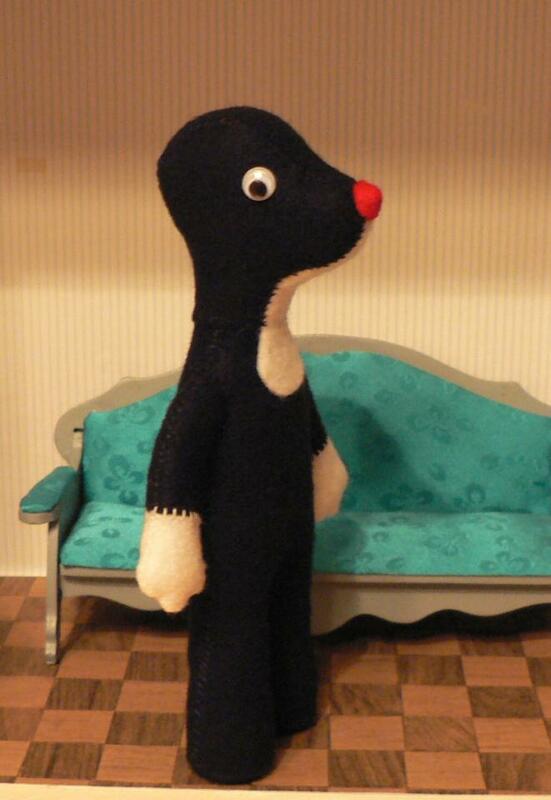 First it was supposed to be a cat, then I gave it a longer nose, so it would be dog, but as the final version of the head reminded me of Krtek (Mole), I left out the ears altogether. Note that the figure can stand on its own. This is due to weights on its feet. The weights make the feet flat and keep the figure from falling down. 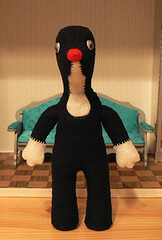 There's also simple wire armature (made of pipe cleaners) inside, so the body and arms can be bent a little. The pattern for the body was so good that I had to try another one. 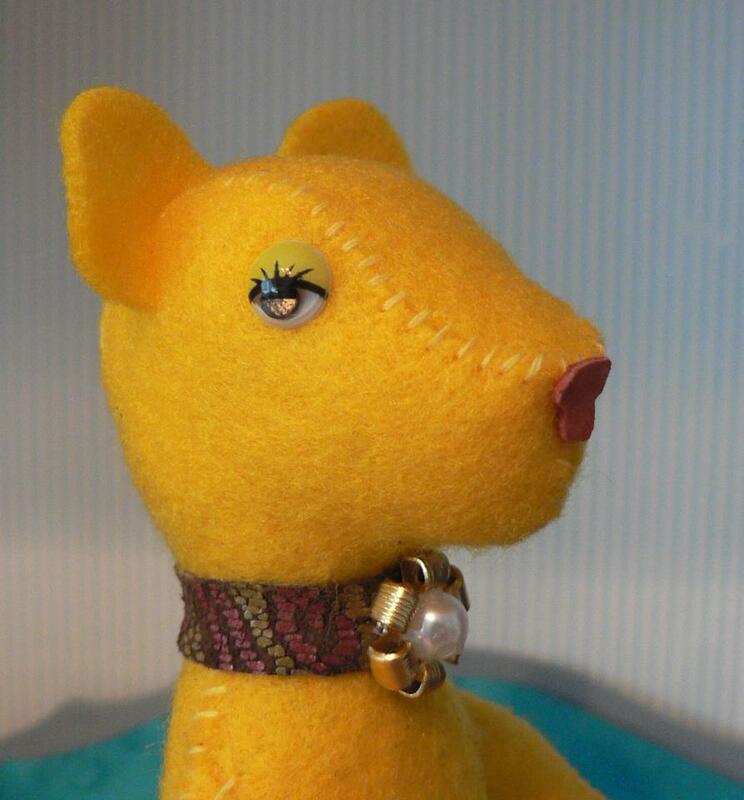 In addition to black and white felt, I had yellow, so I made a lioness. And there was a perfect pair of eyes for her too. The structure is otherwise the same as in the previous one, but there's pipe cleaner also inside the tail. That makes the figure even more stable than the previous one. The head is a bit different as it is made of only three parts: sides and top. The necklace was a last minute addition, put there to cover the neck seam. I found cheap Halloween decorations, one of which was a skeleton approximately in Barbie scale. 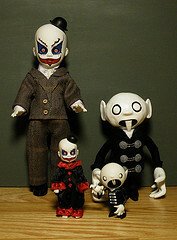 Primarily I wanted it for the "Bones" story (in 6th Scale Stories), but it turned out to have other uses as well. 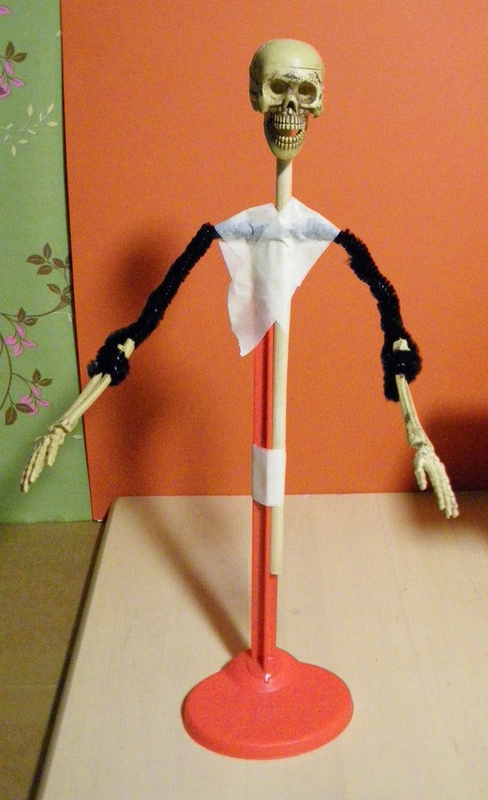 The frame of the Grim Reaper is made of a Monster High doll stand, wooden stick, pipe cleaners, and skull and hands from that skeleton. 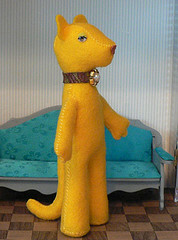 The outfit is wool fabric, which I washed after cutting to get frayed edges. 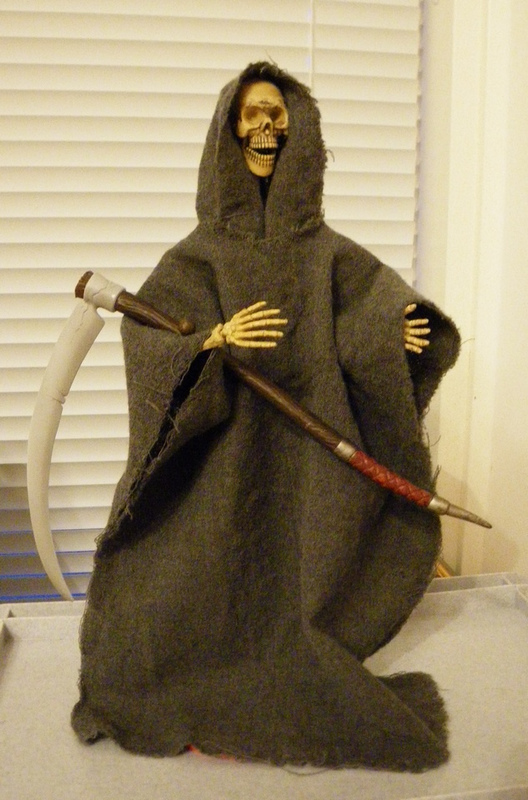 The scythe came from an action figure. This one isn't exactly my design, although I have made him from scratch. 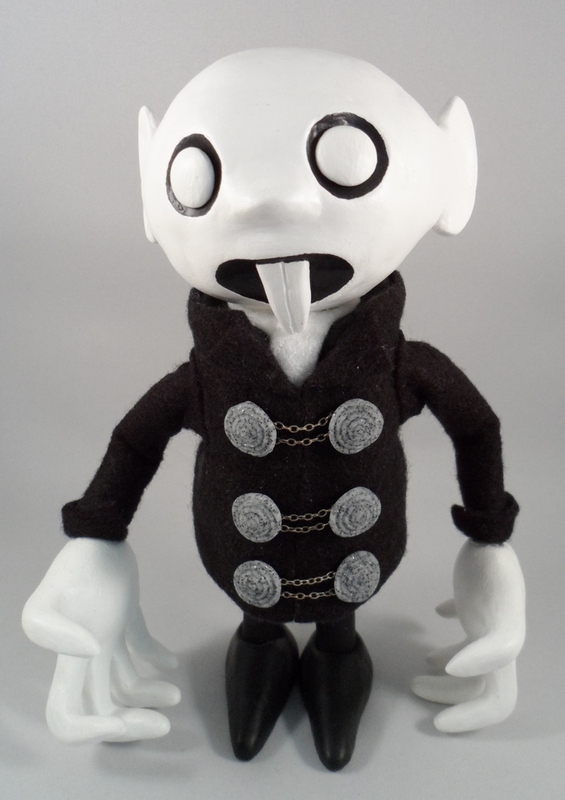 In the second photo, you can see the small vinyl figure I used as a model. As that one plays a role in the Kitty and Riddick stories with Schizo, I wanted to have a larger one I could use in the 6th Scale Stories. For a detailed description and more photos, see in my Crafts blog the postings Maxi Max, Body for Max, and Max is finished.